You can enjoy 1565 square feet of luxury living in this two-bedroom, two-bathroom, sixth-floor condominium. Beautifully furnished and decorated. Southern exposure provides a light and airy feeling. Use the pocket door to close off the handicap accessible guest bedroom/bathroom to make a second master suite with queen-size bed. The master bedroom has a king-size bed, large walk-in closet, and door to the lanai. The master bathroom has a double sink vanity, soaking tub with shower, and a separate toilet room. Enjoy your favorite TV program, ball game, or movie on DVD through the Bose Entertainment System and the 48-inch Samsung flat screen Smart HDTV and DVR. We have Amazon Prime, SiriusXM radio and all the other internet sites that are available like Pandora, etc. Wireless internet is also provided. Fiber optic high speed internet is being installed spring 2019. The 140-sq.ft. screened lanai overlooks Fish Tale Marina with views of the Gulf and sunset. Within a block is Santini Plaza which offers several restaurants, a bank, liquor store, hardware store, clothing stores, a deli, ice cream parlor, etc. There is an CVS Pharmacy on the corner and across Estero Boulevard is a 7-11 convenience store with gas pumps. Fish Tale Marina rents boats, boat slips, dry stack, and has an Eco Tour and charter fishing available among other boating supplies and activities. Crazy Woman Kayak rentals and tours are located in Fish Tale Marina as well. This unit was completed in 2000. It has over nine-foot high ceilings. All the appliances and amenities are first quality, from the full-sized washer and dryer, side-by-side refrigerator with water and ice in the door, corian counter tops, to the glass-top electric range. All TVs are connected to cable, including HBO. Both bedrooms have Smart TV's also. There are ceiling fans in both bedrooms as well as the kitchen, great room and lanai. The pool is temperature controlled for year around comfort. There is a refrigerator and microwave in the cabana building. The spa and barbecue area complete the pool area. Tennis facilities are on the grounds. Situated on the quieter south end of the island this condo is a short drive or trolley ride to the north end of the island where you can enjoy many restaurants, clubs and various other tourist activities. Jan and I are boaters and we love observing the marina activities during the day and it is so quiet at night. We also love the convenience of all the shops, restaurants and bars withing walking distance. Our buildings were completed in 2000 and are newer than most of the other buildings on Fort Myers Beach. The owners association has done a wonderful job of maintaining and improving the property. We enjoy being able to walk to the beach and all the amenities in Santini Marina Mall. We enjoy the 86 degree pool water all year long, surprisingly, it has to be cooled in the summer. We also enjoy the hot tub. Sometimes we can see dolphin and manatees right from the condo. toilet, shower, There is no threshold going into the handicap shower. Master bathroom has a double sink vanity. Guest bathroom has a pedestal sink which makes it more accessible for a wheel chair. Fiber optic high speed internet is being installed spring of 2019. A fifth person would need to sleep on the couch in the great room. Full sized couch and a love seat. There is not a hide- a-bed. There are both a standard coffee maker and a Keurig. The living room has a 48" Samsung HD Smart TV with a DVR Both bedrooms have Samsung HD flat screen Smart TV's. We have Amazon Prime and SiriusXM available. The Bose 321 allows AM, FM and TV sound. Use the Blu Ray player for HD movies. Blu Ray DVD player in the living room, also standard definition DVD player with the Bose 321 system. This unit is handicap accessible. The guest bedroom and bath are connected to make it a suite. A wheelchair has direct access into the shower. The light switches are lower than standard and door handles are all lever handles. Our family of 5 enjoyed our stay! The condo was spotless and close to the beach. We loved the view overlooking the pier. This is the second time staying in this unit, and we will continue to stay here. Working with the owner Tom is a delight, he makes you feel like your a guest in is home. The condo is extremely clean and well taken care of. Sitting on the balcony watching boats is so relaxing you don't want to leave, and we did see dolphin and manatee too. Santini plaza, has some wonderful restaurants and shops. There is a farmers market on Tuesday and Thursday and fresh fruit stand every day. There is a beach access 1 block away which you can rent chairs and umbrella for the day, also 1 mile away is Lover Key State Park with great beaches and hiking/bike trails. Great place to relax and enjoy FMB! This is a great place to enjoy FMB. The condo was clean and modern and overlooked the pool and the marina. Open the front door and enjoy nice breeze throughout the condo. This is a good place for someone in a wheelchair with wide doors, a roll in shower and pedestal sink to roll under. No support bars around toilet. Easy to roll right out to screened in deck with low threshold. Pool area has shaded areas and tables/chairs. Kitchen had lots of nice extras and was fully stocked. Owner great to work with. Highly recommend. Our family stayed in this beautifully decorated and fully furnished condo for Spring break. It has everything you need to feel right at home. It is perfectly located near the marina with stunning views in every direction. Each morning we enjoyed watching the boats stroll through the canal as we would drink our morning coffee on the Lani. We even caught a glimpse of dolphins on several occasions. The condo is approximately four miles from Times Square where there is lots of shopping, restaurants, and the beach. For only $2 per day, you can purchase unlimited rides on the trolley. It picks you up one block from the condo at the corner of Lennell and Estero and will drop you off at Times Square or anywhere in between. The traffic was very heavy during the week we were there and parking was $15 and up, so the trolley made traveling to Times Square easy, affordable and stress free. The condo is just far enough away from the hustle and bustle, yet it's close enough to enjoy the festivities if you wish. In the evenings it was nice to return back to the condo where is was less busy and unwind in the pool and hot tub. There is also a beautiful grilling area with tables to enjoy a meal and the scenery. Tom was very friendly and wonderful to work with. He promptly answered any questions we had regarding our accommodations. We couldn't have asked for a better place to stay. It was the perfect get away! Thank you for this wonderful review. 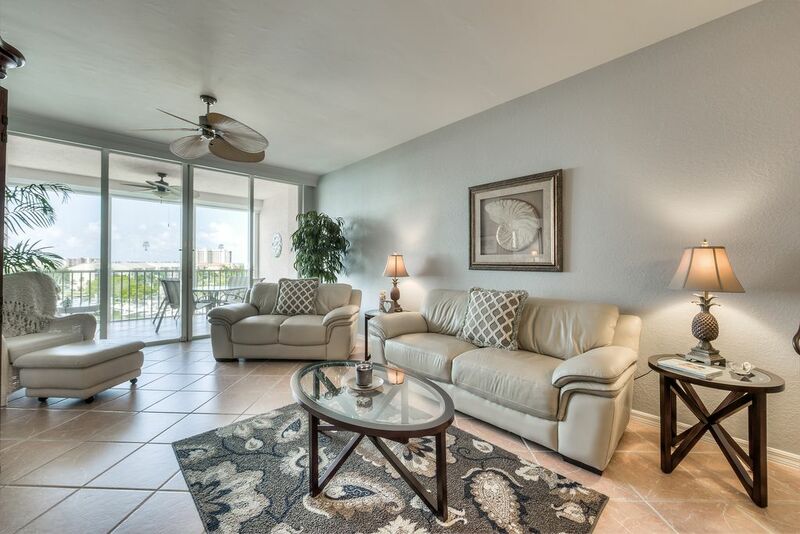 We are continually attempting to keep our condo the best rental condo in Palm Harbor Club. There is also beach access within walking distance of the condo, by the Wyndham Garden Hotel. Just a great spot overlooking the harbor. Lots of boat activity, and quite a few manatees and dolphins floating by that we could watch from the lanai. The condo itself was great, with every amenity you could want. We used the beautiful pool several times, and took advantage of the grille to cook dinner one night. Tom Mertz, the owner, was unbelievably responsive and helpful with any questions prior to and during our trip. We will definitely reach back out to Tom to rent again! Thank you for this positive review. We try to make everyone’s stay as enjoyable as possible. This property is well stocked, clean, tastefully decorated with all the amenities you would need for a relaxing vacation. The neighbors were wonderful, beautiful view of Fish Tale Marina where we rented a boat to fish and sightsee several times. You can walk to dining, shopping, fresh markets, spas and the beach. We can not wait to return next year!! Thank you for the very nice review.